On Tuesday night, NYPD Housing Officer Randolph Holder was fatally shot in the head while in pursuit of a gunman in East Harlem. Holder had been responding to a call reporting an armed robbery of a bicycle at a park, The New York Times reports. The officer was taken to nearby Harlem Hospital, where he was said to be in critical condition by police officials, and died approximately two hours later. Holder was 33. The suspected gunman, who was riding a bike during the police chase, was shot in the leg during the exchange of gunfire. The gunman's identity has yet to be disclosed. He was then brought to a different hospital and is expected to be released into police custody sometime Wednesday, Commissioner William J. Bratton said at a news conference. 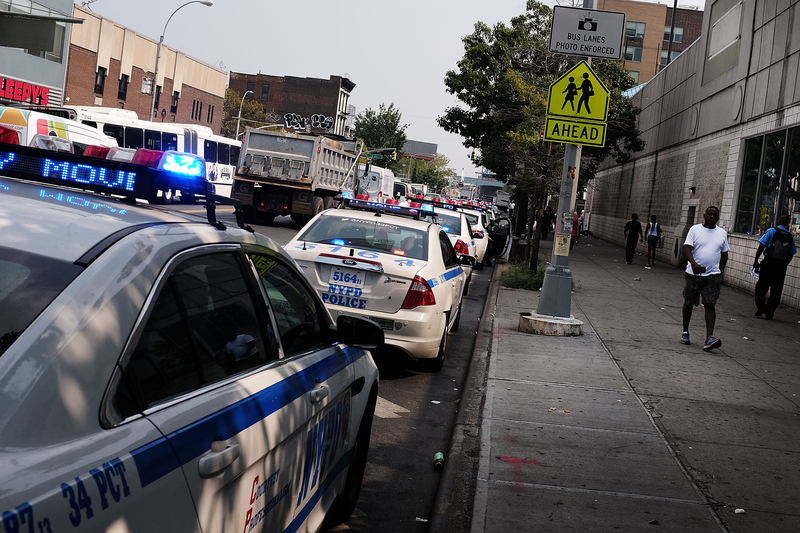 Police also took three other men into custody for questioning about the event, according to the Times, and investigators shut down part of FDR Drive, a major thoroughfare, following the shooting. While details about the robbery and subsequent police chase are still unfolding, information provided by officials at the press conference held just after midnight on Wednesday provide some insights into the life of the late Officer Holder. Holder had been assigned as a Housing Officer to conduct patrols in a service area that covers parts of East Harlem and the Upper East Side. Patrol duties included checking for illegal activity in and around housing complexes. Holder, an immigrant from Guyana, became an officer in July 2010 and came from a family of police officers, according to Heavy. Both his father and grandfather served as policemen in Holder's home country. Holder's father was at the hospital, Commissioner Bratton said during the conference. New York City Mayor Bill de Blasio stated at the press conference that the entire city is in mourning of Holder's death. "We are humbled by Officer Randolph Holder's example, an example of service and courage and sacrifice," de Blasio said. Police departments in other parts of the country published messages of condolence following news of Holder's death. At least 100 NYPD officers were seen leaving the hospital where Holder was brought for care, the New York Daily News reported. Our thoughts are with Holder's family.